After a man has killed his wife, he becomes convinced she is haunting him. 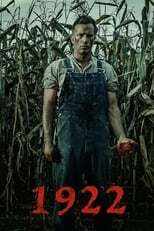 1922 is directed by Zak Hilditch and was released on Oct 20th, 2017. Director Zak Hilditch's Crime & Drama movie 1922 is produced by Campfire & Netflix & was released 2017-10-20.